The design of the urban infrastructure can be improved by using the frameworks Urban Mobility (PDF) (Immers, Egeter, Diepens, & Weststrate, 2015) and Functional Ambiance (Verheijen & Smidt, n.b.). The following steps need to be taken to examine the streets and their use in the context of the entire urban mobility. First, the location, layout and function of the street are investigated. Is it a primary street with a lot of traffic? And what activities are taking place in the street? Next, the traffic flows are determined. What vehicles use this street and why? What is the layout of the traffic space? Then the style and character of the street are analysed. What makes this street unique and different from the next street? Preservation or improvement of the identity is the main aspect of spatial quality. Only after these steps, the local function of the street for (local) traffic is considered. The normative vehicle family is based on the approach of Urban Mobility. This allows the proper speed regimes and their appropriate domains to be implemented. Finally, the procedure of Functional Ambiance is applied to further optimise the design of the urban infrastructure. 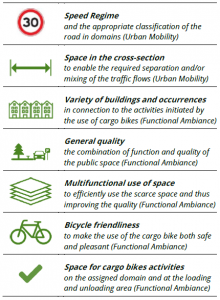 In this downgraded form, the optimisation of seven factors aids the implementation of cargo bikes in urban logistics. The quality of the urban public space can be determined by measuring the seven quality factors. Not the amount of available space, but the way the available space is used determines the quality. The factors are perceived from the perspective of urban distribution by cargo bike. The quality can increase by optimising each one of these factors. A green icon indicates high or sufficient quality. A grey icon implies there are opportunities to upgrade certain aspects. And a red icon marks a problem, that absolutely needs to be solved. The infrastructural ideal image of the street is described through the ideal domains, the normative and permitted vehicle families and the appropriate speed regime. The number of domains provides the number of (composed) traffic flows. In practice, the maximum number of flows is four: the pedestrian domain (footpath), the bicycle domain (cycle lane/path), the car domain (road) and the guided domain (tram tracks). The normative vehicle determines the layout of the traffic space in each domain. The speed regime is the last variable to regulate differences in speed on a domain. The framework Functional Ambiance presents opportunities to boost the quality of the public space. The speed regime and use of space in the cross section are set by utilising the approach of Urban Mobility. The five remaining factors are inspired by Functional Ambiance. Each factor where opportunities or problems arise is a starting point for discussion. This study provides solutions for each of these cases, but more solutions can be explored as part of a creative process. The provided solutions are minor and easy to implement solutions, without completely redesigning a street. These solutions also form a toolkit of measures, that can be applied in different streets where similar problems occur. A local urban design team is always required for the exact implementation.